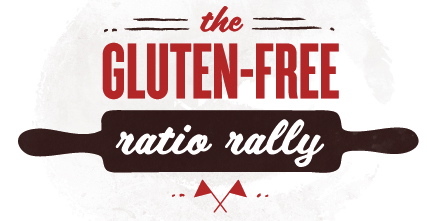 If you’re not yet familiar with the Gluten Free Ratio Rally let me give you the quick low down. It’s all about gluten free baking with ratios. I know it can get a bit technical around here on such days and ratios mean baking by weight but please don’t run for the hills! The way I see it, baking by weight is just scary in the beginning because it’s a new concept to most. For serious bakers out there I assure you that once you make the change you’ll never look back. I know I haven’t. Above all the Ratio Rally is about experimenting, learning, and becoming better and more confident gluten free bakers. Can you imagine what you could create if you just had a bunch of ratios in your head? A ratio is a base that you can be confident of. After that you can change it up any way you like. What drew me to it was the idea that I could create my own recipes and build a collection of my own. This month’s Gluten Free Ratio Rally is all about Choux Pastry and is hosted by Erin of The Sensitive Epicure. The awesome thing about Choux Pastry is that it is the base for so many different things. Eclairs, Profiteroles, Gougères, Pets de Nonne, French Crullers, and even a type of Gnocchi. Yum. With all those choices it really was a hard decision to make but I decided to go with something I haven’t made before. Plus this post kinda sold me on the idea. 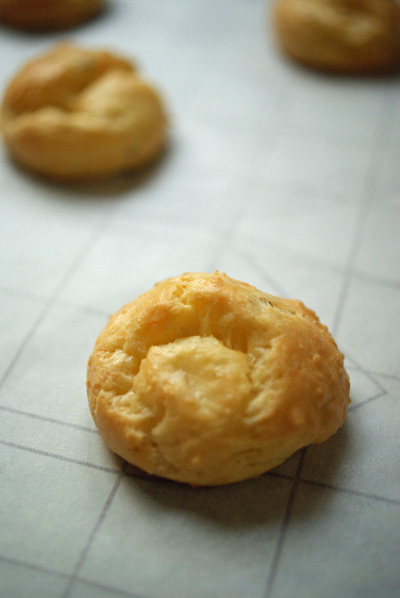 Gougères are little french cheese puffs. I suppose you could use any cheese you like but a hard, strong cheese is best. I used 3/4 gruyère and 1/4 parmesan.They were perfect eaten alongside the butternut squash soup that I made for dinner that night. 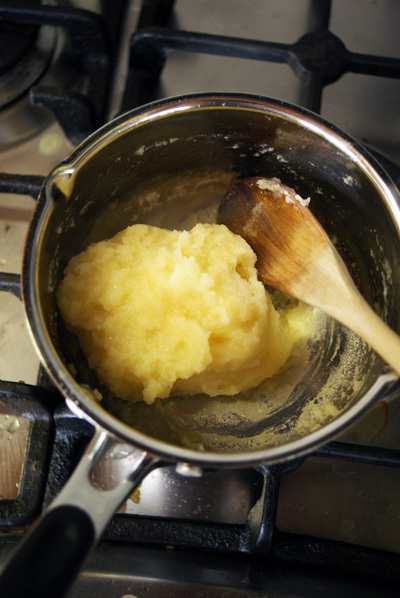 The basic ratio by weight for choux pastry is 2:1:1:2, liquid:fat:flour:egg. 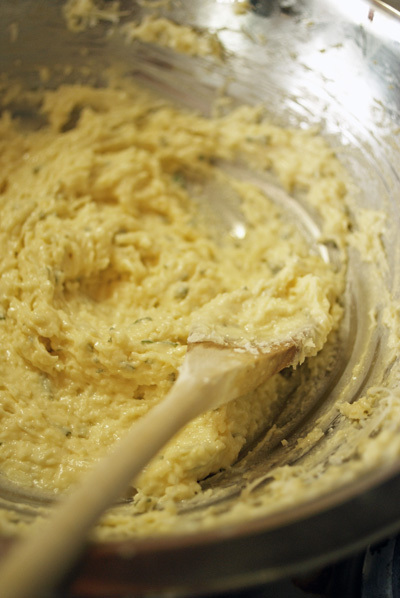 There is also a ratio that works by volume, 1 cup water:1/2 cup butter:1 cup flour:1 cup eggs. I’ve used the volume ratio since I started baking so I decided to stick with that. I found that the uncooked gluten free choux pastry was quite different in texture to it’s gluten-full counterpart. It didn’t pull away from the pan as cleanly and didn’t have as smooth a texture. It was also quite significantly more elastic which made adding the eggs a little more difficult. In the end they didn’t puff up as much as I hoped but they cooked through and had great texture and flavour. One of the main things I have learned while baking gluten free is that you can’t expect it to act like it’s gluten-full counterpart. If you do you will fight it and end up disappointed. Preheat the oven to 220°C/425°F and line a baking sheet with non-stick baking paper. 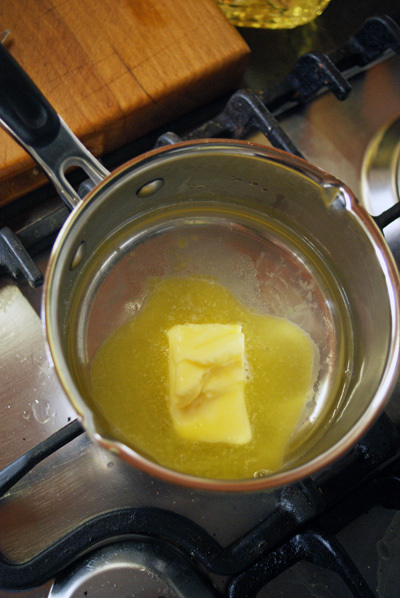 Combine the water, butter and salt in a medium saucepan and heat, stirring to dissolve the butter. Bring to a rolling boil. Add all the flour at once and stir vigorously until you have a paste that pulls away from the sides of the pan and forms a ball. 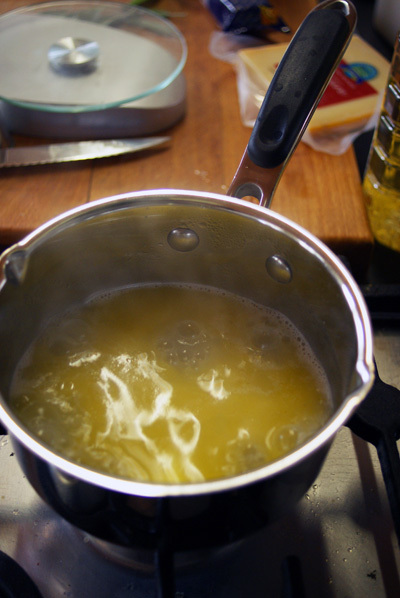 Remove from heat and place into a large stainless steel or glass bowl. Spread the mixture into a thin layer over the bottom of the bowl to allow it to cool faster. Leave to cool until it is still very warm but not hot. 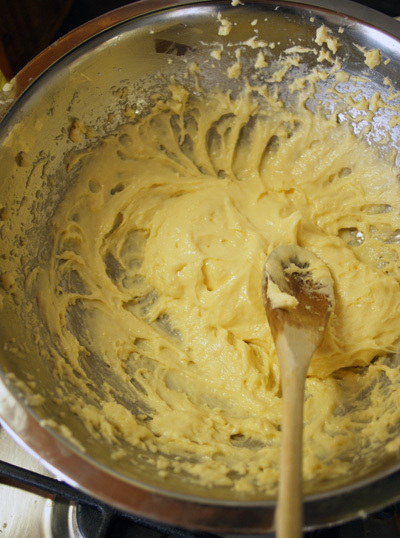 Add the eggs, one at a time, beating vigorously with a wooden spoon or electric mixer to incorporate them into the batter. Only add the next once the one before is fully incorporated. At first it will look lumpy and seem like it won’t mix in, but just keep going and it will smooth out. You want the mixture to be able to hold it’s shape but not be too firm. 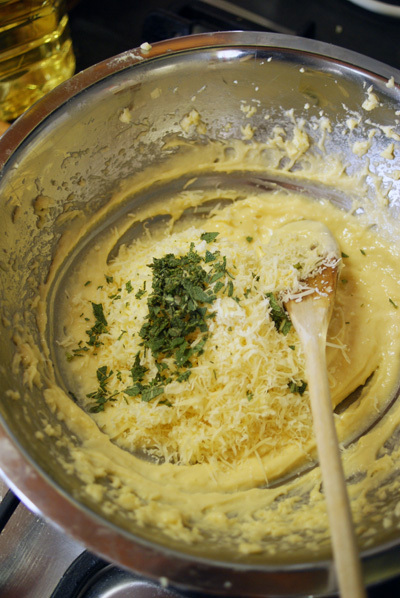 Add the grated cheese and stir until well-mixed. Scrape the mixture into a piping bag with a plain tip and pipe rounds onto the prepared baking sheet, leaving spaces between them. If you don’t have a piping bag you can use two spoons to drop dollops of the mixture onto the sheet. Bake for 10 minutes, then turn the oven down to 190°C/375°F and bake for an additional 20 to 25 minutes, until uniformly golden brown. Remove from the oven and poke a hole in each puff to release the steam (this is to ensure that the trapped steam doesn’t cause the puff to collapse). Transfer to a cooling rack to cool or use immediately. wow they look awesome.. gonna give them a try . Love them!! 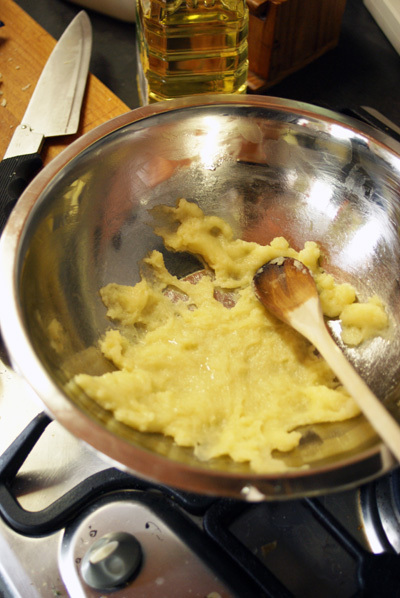 And love your process photos – looks like the choux pastry held up rather well and puffed quite nicely!! The combo of fresh herbs and cheese sound wonderful. I was also impressed that you hand mixed the “shoe paste” as my sister likes to call it. A great addition to the rally! Thanks Charissa :) I wasn’t too impressed with my decision half way through when my arms were cramping up but what can you do? They look delicious, and I love the sage and thyme addition! Thanks! I love herbs, they can lift any dish to something better. Lovely-looking gougères! Looks like they puffed up nicely – very light and airy! Great process pictures, too. 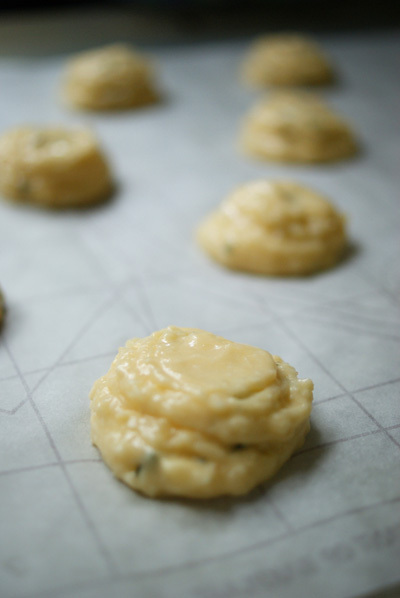 Oh-so-helpful for people who haven’t made choux before! Yum! Your pictures are very informative & helpful Can you tell us more about the flour you used? Nice work. Thank you for participating in this month’s GFreeRally challenge. It was a doozy! Oops! Forgot to chat about the flours. The flour mix I use is one I got from Shauna, It’s 40% whole grains, 60% starches. I generally make up a 1kg mix, 200g each of white rice flour, potato flour, tapioca flour, brown rice flour and millet flour. Aha- almost asked about the flour, but then I read the comments. Thx for clearing that up! Loved the how-to. I am super familiar with “pate a choux” as we call it in school, and especially the 2:1:1:2 ratio. Loved the little lesson you gave there! If you are searching for some more awesome gluten free recipes (some of them are seriously better than the real thing), google Chef Richard Coppedge. He is amazing at what he does! Thanks for the tip! :) will check him out. Left a comment on your blog btw, awesome!